When Matthew Perry sailed his squadron of warships into Edo Bay in July 1853 – and compelled the local authorities, under threat of bombardment, to accept a trade treaty with the United States – Japan had been a closed society for well over two centuries. Under the policy known as Sakoku (“locking the country”), practically all trade with the outside world had been strictly prohibited. Christianity was banned, foreigners already in Japan were expelled, and others were forbidden, on pain of death, from entering imperial territory. The Japanese, similarly, were not permitted to leave. For 220 years, the country remained almost entirely isolated, mostly peaceful, and profoundly mysterious and alluring to outsiders. As time went on… more sophisticated people attempted to disprove the fanciful descriptions of the Dutch that were in common circulation. “People say that the Dutch have no heels, have eyes like animals and are giants,” related one man, “but the fact is that people of every country differ somewhat, and just because the Dutch do not resemble us, we must not say that they are like animals. We are all products of the same Creator.” [Even this writer, however,] felt that it was not worth the effort to deny the rumor that when Dutchmen urinate they raise one leg like dogs. When the Japanese discovered that Thunberg was far more learned than any of his recent predecessors, they plied him incessantly with questions both at Nagasaki and at Edo when he visited the capital. Thunberg recorded how the Japanese looked up to him “as an oracle, whom they suppose capable of giving them information upon every subject,” but at last the inquisitiveness that had so characterized their earlier dealings with the Dutch had been given a direction. First, a few words of clarification. The loss of ships on the eastern coast of Japan was nothing new. The area has always been subject to strong currents and storms, particularly in January, at the height of the northeastern typhoons; hence it has always been a dangerous area for shipping. In the northern parts of Japan there are currents that push ships towards the mainland of Asia, and onto Chinese and Russian territory. 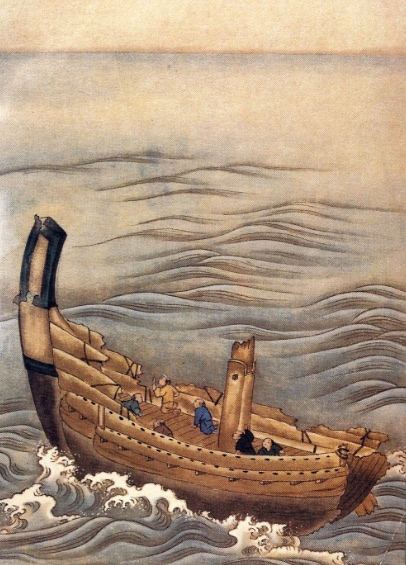 Any ship sailing along the eastern coast, meanwhile, risked being caught in a storm; if she was blown offshore and disabled she would soon find herself caught in what Japanese mariners call the kuroshio – the “black stream” – a strong trans-oceanic current, flowing slowly east at the rate of that varies from 10 miles to about 36 miles a day, which is the Pacific equivalent of the Gulf Stream. The kuroshio flows from the coast of Taiwan north to Japan and then swings east, where it merges with the North Pacific current; for a ship caught in it, the next stop would be the Aleutian Islands, or the American coast between Vancouver and Los Angeles. What made the ships survivable was their cargoes. The tribute paid by Japan’s more distant provinces to the Emperor and the Shogun in Edo was generally remitted in rice, and – Japanese roads being frequently impassable in winter – that rice was generally sent by sea. That meant that the crew of a crippled vessel adrift on the Pacific often had an almost limitless supply of food to sustain them. Yes, scurvy remained a fatal problem, and the crew still required a good measure of luck to catch sufficient rainwater; there are many records of Japanese ships reaching the American coast apparently abandoned, and of boarding parties discovering the crew all dead. But in an equal number of cases at least a handful of sailors survived months of despair and privation, to begin extraordinary adventures. By the time the storm had abated the Cho-ja maru was leaking so badly that she required constant bailing and was out of sight of land. Without even a compass to guide them, the 10 members of the crew had no choice but to wait and pray and ration what remained of their food until they sighted land. The weather gradually grew warmer, but this merely increased the torment, since the men were by this time terribly short of drinking water and the rains had ceased. Two men died after drinking seawater, the captain – who was blamed by his shipmates for failing to forsee the storm – committed suicide, and the remaining seven men endured hideous conditions for four months until, in April 1839, while still in the middle of the Pacific, the Cho-ja maru fell in with the American whaler James Loper. The Loper and her consorts rescued them, but there was no swift return to Japan for Jirokichi and his shipmates. For six more months the Japanese remained on board the Loper, searching the endless wastes of the North Pacific for whales, and it was not until September 1839 that Captain Oleb Cathcart informed the Japanese (using gestures and some sort of pidgin, one imagines) that the next day they would reach the Hawaiian Islands. In Hawaii, the sea drifters were placed in the custody of members of the local Chinese community, who were able to communicate with them in writing. When Jirokichi and his friends realised that the Chinese planned to recruit them as labourers on their sugar plantations, though, they complained to Cathcart, who promised to try to find them passage on a ship heading for Canton. From there, he thought, it ought to be possible to find a ship sailing towards Japan. probably about 25 or 30 years old, for I do not recollect how old he called himself. He was a man of middling stature, but ecceedingly muscular, as may be judged from the fact, that he has more than once of his own accord been down to the beach, and has taken a barrel of flour on his shoulders, brought it up with perfect ease, and set it down upon the floor, with as much steadiness as any man could set down a pound’s weight. He was employed probably as clerk of the junk; he was pretty well versed in writing, and had some skill in drawing. His name was Ijero… and being ready in catching up with both the Hawaiian and English languages, it was from him that most of my information was obtained. This was our first experience of seeing an American woman and child. the wife was very pretty and seemed gentle. She was dressed in beautiful clothes. Her hair was reddish and the pupils of her eyes were almost white. The child was four or five years old, but we were astonished to see that his hair had already become completely white! It took the best part of 10 months for the Japanese to find a ship headed back west across the pacific. To their disappointment, China was more or less closed, thanks to the Opium Wars, and Jirokichi and his surviving companions were eventually forced to take a circuitous route home via Kamchatka (where they spent an uncomfortable 10 months and found the rough Russian food completely inedible), Russian Alaska and the Kurile Islands. Jirokichi impressed the Russians with several feats of strength, defeating all comers in wrestling matches, and continued his careful observations of foreign customs and innovations – this time including compiling the first Japanese description of a steam powered ship. Harsh though Jirokichi’s experiences were in many respects, they pale in comparison with those of other Japanese sea drifters, especially those unfortunate enough to have been pulled westwards onto the Russian coast – and not solely because of the decidedly primitive conditions that prevailed in bleak Kamchatka, where the Russians had maintained a toehold ever since first arriving there as recently as 1697. The Russians, unlike the British and the Americans, were close enough to Japan to realise the importance of seizing any Japanese sea drifters who appeared on their shores, and a succession of unfortunate sailors were taken by force into the Russian interior, where they were compelled to work as language instructors and interpreters, and were often forcibly baptised, an action that (whether the Russians realised it or not) all but guaranteed that they would not be permitted to return to Japan. The earliest of these drifters, an Osaka merchant’s clerk known to the Russians as Dembei, was wrecked on Kamchatka in 1695, shortly before the peninsula was annexed by the Tsars. Dembei and his comrades were set upon by bow and arrow wielding natives and taken captive, living among them more or less as slaves until 1697 when Dembei was rescued by the explorer Vladimir Atlasssov. Atlassaov sent the former captive to Yakutsk by sledge, and from there Dembei was forwarded to Moscow and, eventually, St Petersburg – a journey that took three years, all told, but which did supply Dembei with enough of a working grasp of Russian to be useful when he was granted an audience with Peter the Great (19 January 1702). At Peter’s request – which was, of course, effectively an order – Dembei remained in Russia and was given help in setting up a Japanese language school, located first in St Petersburg and later in the remote Siberian town of Irkutsk. assured Dembei that eventually he would be allowed to return to his homeland, but he evidently considered the captive too valuable to be let go; when Dembei asked for permission to go back to Japan in 1710, he was refused. Peter also went back on another promise when he ordered that Dembei Christened, and he was known by the Christian name, Gavrill [Gabriel], after that. It was Dembei’s fate never to return home [and] he proved so useful to the Russian government as a language instructor that it was decreed that whenever a Japanese ship drifted to far eastern shores, one of the castaways was to be sent to the capital to teach Japanese. Otokichi, who was wrecked on the coast of Washington State in 1833 and eventually settled in Singapore. Being numb with cold, for it was January when they reached the coast of America, the sailors were told to rub themselves against each others’ bodies to keep warm. The women led the sailors nearer to their fires and brought out fur pelts for them to wear. One long building houses the entire Indian community. It was partitioned off into separate rooms for each family. Their food was not cooked or broiled; they subsisted on dried fish. Having no flintstones, they painstakingly started a fire by rubbing two dry sticks together. Utensils were scarce. Each person possessed one all-purpose bowl. Not only did they eat from it, but they used it to save their own urine, which was used to wash their faces. This custom revolted the fastidious Japanese. The three strangers were viewed with suspicion and curiosity by the natives; to ensure that they did not escape, they were tied together with thongs. The Indians always kept a careful watch over them. The captain saw the three pitiful captives and tried to determine their origin. 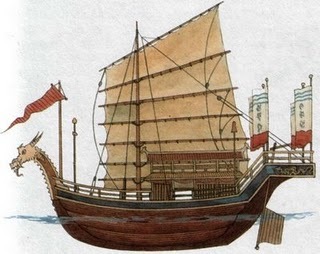 He noted their olive skin and Asiatic features, and when he was shown a splinter of their ship bearing the name in Chinese characters, he was all but certain that they had somehow come from across the sea. On a scrap of rice paper they wrote their names, drew a picture of a shipwreck, and made a sketch of the three of them secured in thongs. This paper was handed over to Dr John McLoughlin, chief factor of the Fort Vancouver post of the Hudson’s Bay Company… [and] McLoughlin lost no time in despatching an employee to the remote area to secure the freedom of the slaves. Two of the captives were released almost immediately; the third, Otokichi, who had been taken inland by the Makah, was brought back to the coast and redeemed later. The three Japanese were treated at the hospital McLoughlin had founded at Fort Vancouver, and tutored in English at McLoughlin’s school. The Factor then sent them to London, together with a letter suggesting they be returned to their homeland in the hope that this humanitarian gesture might help open up Japan for trade. “If they are taken to Britain first, they will surely embrace the dignity and power of Great Britain. Then they will have the opportunity to relay this impression to their own people,” McLaughlin wrote. Otokichi and his companions arrived in London in June 1835; they were the first Japanese ever to see the city. Unfortunately, no record remains of their impressions, and the hard-headed directors of the Hudson’s Bay Company were unimpressed by Factor McLaughlin’s decision to send the men half the way around the world at their expense; it would have been cheaper, and more sensible, they thought, to have packed them off to the Sandwich Islands (Hawaii) and thence back across the Pacific the way that they had come. It was Gützlaff’s tragedy that the Japanese he was learning from the sailors would prove to be worse than useless to him; the sea drifters spoke only a low dialect, and “for Gützlaff to use this language with the kind of people he intended to contact would be like speaking English sailors’ jargon at a diplomatic soirée in London.” It was Otokichi’s that the longed-for return home never occurred; the castaways spent two years in Macau before taking passage on an American merchant ship, the Morrison, whose captain decided not to reveal he had Japanese sailors on board when he called at the Ryukyu Islands. But the temptation proved too strong for the homesick boys. When they heard the familiar sounds of their native tongue, they joyfully entered into conversation with the crews of the junks in the harbor. This was to doom their hoped-for repatriation and the success of the whole expedition. One of these junks was hurriedly dispatched to the mainland to alert the government of their imminent arrival… [and when] the ship entered Edo Bay under hazy skies, immediately the booming of cannons could be heard from all sides. The Japanese castaways were much distressed by this turn of events. Having wandered around the world for some five years, they had eagerly looked forward to their return home. To be driven away not once, but twice, was discouraging indeed. Otokichi and his comrades vowed that since Japan no longer wanted them, they would no longer recognize Japan as their home. Eventually, Otokichi adapted to his circumstances. He is reported to have married an Englishwoman, who died, and then an Indian, with whom he had three children. He eventually settled in Singapore, where in 1862 he encountered a Japanese commercial embassy that – the country having been opened by Perry in the meantime – was on its way to Europe. Otokichi came to their hotel to see if he could help them or guide them around the city. The outward signs of the former castaway’s success – the two-storey house with spacious garden, two servants., etc. – were sufficient to arouse surprise in the minds of the visitors. Otokichi’s hospitality towards them, nonetheless, was interpreted as a sign of loneliness by the xenophobic officials. It was inconceivable to them that any Japanese would chose to live among foreigners. At Onoura village, in the remote Chita peninsula, at the foot of a mountain, by the sea, there is a small and forgotten memorial to the men of the Hojun-maru. The snow had turned to rain in the village, and it was as silent as death as I walked down the winding streets hardly wide enough to allow one to stretch out both arms. I felt closed in, for on either side were the dark walls of the houses with their slatted windows and the closed shutters of the shops. Only a glimpse of the sea now and then lent any light to the heavy atmosphere. For the tiny village of Onoura, this ship disaster in 1832 was a major event… In the minds of their friends and families, the fourteen men had vanished forever. They had no way of knowing that some of the sailors had survived the shipwreck and had literally circumnavigated the earth. After five years had elapsed, they had even sailed to within a few miles of their homes, unbeknownst to their families. C.R. Boxer. The Christian Century in Japan, 1549-1640. Berkeley: University of California Press, 1951. Braden, Wythe E. “On the probability of pre-1778 Japanese drifts to Hawaii.” Hawaiian Journal of History 10 (1976). Charles Wolcott Brooks. Japanese Wrecks Stranded and Picked Up Adrift in the North Pacific Ocean. San Francisco: California Academy of Sciences, 1876. Kato Eichii. ‘The age of the great voyages and Japan’s “national seclusion.”‘ In National Committee of Japanese Historians (eds), Historical Studies in Japan 7 (1983-1987). Tokyo: NCJH, 1990. Donald Keene. The Japanese Discovery of Europe: 1720-1830. Stanford: Stanford University Press, 1969. Stephen W. Kohl. “Strangers in a strange land.” Pacific North-West Quarterly, Jan. 1982. George Lensen. The Russian Push Towards Japan: Russo-Japanese Relations, 1697-1875. Princeton: Princeton University Press, 1959. Katherine Plummer. 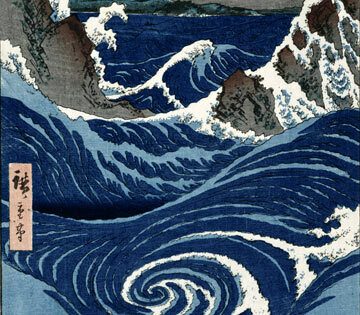 The Shogun’s Reluctant Ambassadors: Japanese Sea Drifters in the North Pacific. Portland [OR]: Oregon Historical Society Press, 1991. JoAnne Roe. Ranald MacDonald: Pacific Rim Adventurer. Seattle: Washington State University Press, 1997. Kazuo Ninomiya. A View of the Outside World During Tokugawa Japan: Reports of Travel by Castaways, 1636-1856. Unpublished University of Washington PhD, 1972. John E. Van Sant. Pacific Pioneers: Japanese Journeys to America and Hawaii, 1850-80. Chicago: University of Illinois Press, 2000. Bert Webber. Wrecked Japanese Junks Adrift in the North Pacific Ocean. San Francisco: Ye Galleon Press, 1984. Very interesting article. Amazing that they managed to maintain this cultural isolation for so long. And prehistoric drifts as well? I’m so glad I discovered your site – this is a fascinating series of articles that sheds light on forgotten corners of history.